Thanks to the very fortunate events (and to the mighty internet), we came across a very special musician a while back and we knew we had to do this. We’ve been eagerly waiting to introduce him on Mashareeb, it took us a while, but it’s finally happening! Ahmed Tarek Ola-Abaza is an Egyptian who lives in New Zealand. He makes experimental electronic music that we found very special , very distinctive, very daring and very unusual. We thought there would be nothing better to tell us more about him and his music than to directly ask him questions. Ahmed: My four-part name is Ahmed Tarek Bahgat Abaza but for music I omit ‘Bahgat‘ and insert ‘Ola-abaza‘ because ‘Ola‘ is my mother’s first name. I was born in Cairo, Egypt but I now (2011) live in Christchurch, New Zealand. My childhood education was in Cairo and from New Zealand I have a Bachelor of Arts in Political Science and Sociology and my postgraduate work is ongoing in Philosophy. My main interests in life are reading, writing, music and, of course, Egypt. Ahmed: I would rather play it to you. But I will try to describe something. There are pieces which are quite different from each other. I just call it electronic music or experimental music. I treat the sounds you create with synthesizers and use as a basic part of the composition process along with notes. I can say my music is mostly instrumental and with rich textures, playing around with some of the many ‘styles’ that I have been exposed to. I study philosophy but not much philosophy of music. I treat it as just another social practice. How did it start and what made you get into electronic music? Ahmed: Egypt is my everlasting love and when I was 14 in 1999 Christchurch I was especially homesick and a bit of an Egyptomaniac. The millennium celebrations in Egypt were to be marked by a concert called ‘The Twelve Dreams of the Sun‘ by Jean Michel Jarre. I followed the news about this obsessively, not because of the music but because it was the Egyptian celebration. Eventually I heard Oxygene 9 and the synthesizer textures and sound design on this piece impressed me. I had only heard standard pop music so far and some classical and Arabic music. This ignited my love for music in general not just electronic music. I later heard pieces of Jarre’s which evoked memories of my Egyptian childhood as his music was used on some TV and radio. Then I began to compose when I was 15 as this interest developed more strongly and I discovered many other artists. Ahmed: Autechre, Laurie Anderson, Jean Michel Jarre, Boards of Canada, Philip Glass and Vangelis are my main musical inspirations. If we keep the list very short. What kind of instruments and equipment do you use? 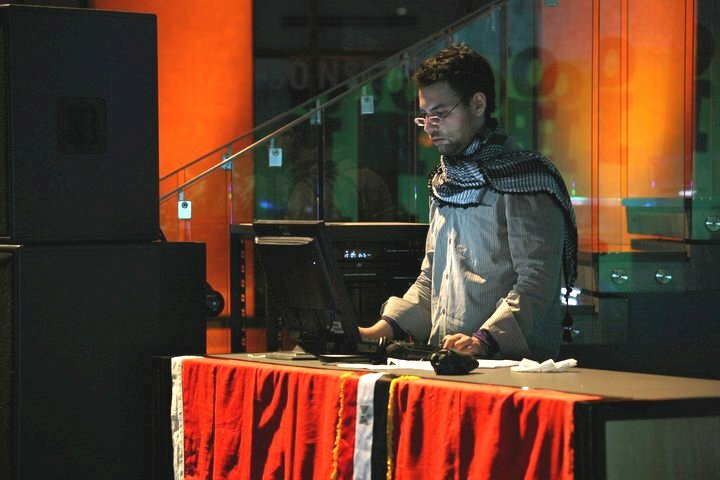 Ahmed: It is a very limited set-up with a MIDI keyboard and controller an Audio-MIDI interface, studio monitors and a computer with much software. All the instruments so far are software synthesizers and samplers along with sequencers and other types of applications such as notation software. What do you think about the electronic music scene in Egypt? And what do you think about the genre’s future in Egypt and how can it be improved? Ahmed: It is still somewhat in the underground. I hope that for many fields of art and non-art in Egypt there would be a renaissance following the resignation of Hosni Mubarak. Egypt is a diverse country of many tens of millions who have much to offer. The last time I visited Egypt though the kind of highly experimental electronic music artists such as Autechre make definitely was not in vogue. But they are not well-known in New Zealand either! At least I know there is interest and people working in the field. You have performed live and made other appearances, what is that like and how exactly does your performance go? Ahmed: I did things related to my music and others to my academic interests like radio interviews and once as an analyst on TV as Mubarak gave his last speech. It is not usual for me to be in public or the point of attention – I dislike it. At an audio-visual performance I was invited to hold at the Auckland Museum in April 2011 I had big technical problems in the preparation stage (my sound card was broken). I only got a working audio interface days before the show. So any hope of playing directly on my virtual instruments was gone – I simply DJ’d the music to the visuals and controlled the mixer. Some of my music is not playable easily on keyboards anyway! I enjoy this but it is also stressful and challenging. What are your dreams and goals in terms of music? Ahmed: I have an old three-part project and I dream of finishing it! The project goes back to the age of 15 when I began composing because I am using my old tunes that I had not taken seriously when I first wrote them to make new material as one part of the project. Other parts involve entirely new material. I also hope to get more opportunities to join music with visuals for live audiences following the rough and hastily created experiment at the Auckland Museum. I am playing another concert soon (in Christchurch) but I have not created a visual component this time. We would like to thank Ahmed for this insightful interview and for giving us the opportunity to talk with him. We’ll leave you now with a selection (made by him and us) of some of Ahmed‘s music, enjoy!